Mia Cienfuegos, right, and Cassandra Lee Perez, left, hold flags while performing the song “Carnaval Del Barrio” at a rehearsal before their show run last week. 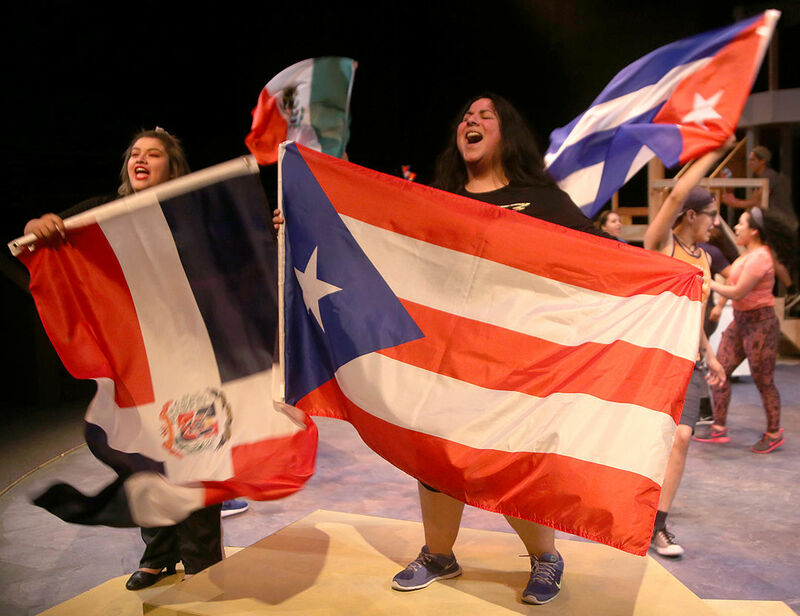 UTRGV Theatre produced Tony and Grammy award winner Lin Manuel-Miranda’s “In the Heights” as part of the university’s FESTIBA programming. Brian Warren, an assistant professor of theater at the University of Texas Rio Grande Valley, said the school’s theater department works to bring a diverse range of productions for students. That is one of the reasons “In the Heights” was chosen as a recent production. Warren called directing Lin Manuel-Miranda’s musical an “easy choice,” not only because of the quality of the material and message, but also the kinds of characters. Set in the Dominican-American community of Washington Heights in New York City, “Heights” is a rap-infused musical dealing with gentrification, importance of family and the next generation after immigrating to the United States. Warren said he liked the idea the story gives respect to older generations of immigrants. “This isn’t just some other musical where all the characters are Caucasian,” said 19-year-old ensemble member Brianna Ramirez. “These are actual Hispanic characters and I feel that’s so important. Sometimes students worry that no matter their training, they won’t get cast in roles unless “your look is exactly what Hollywood wants,” he said, adding that it’s changing. A challenge with producing this contemporary piece was the music, which requires most players to rap over a blend of Reggaeton, Salsa, Merengue and Latin jazz. Warren said he relied on collaborator Gina Rodriguez, who served as music director, and conducted the nine musicians on a second-story structure constructed on stage making the group part of the setting, Warren said. With live music, actors can “take liberties with their pause(s) … and take (their) time,” she said. Another aspect new to some students in the ensemble was singing while dancing, which is “challenging for everyone in the show,” said female dance captain Princess Chavez, 20. Male dance captain Roman Rossetti, 19, called “Heights” a “dance-heavy show,” with a mixture of Salsa, hip-hop and Flamenco. Chavez referenced a particular number titled “Carnaval Del Barrio” where actors wave an assortment of Latino countries’ flags. She said “Heights” inspired her to research her roots. Rossetti said not only was the piece entertaining, but educational because it reveals the dynamics of different cultures. He said it was a testament to our current society and relevant. “Immigration is an issue now more than ever,” he said.